Uniflow engines potentially allow greater expansion in a single cylinder without the relatively cool exhaust steam flowing across the hot end of the working cylinder and steam ports of a conventional "counterflow" steam engine during the exhaust stroke. This condition allows high thermal efficiency. The exhaust ports are only open for a small fraction of the piston stroke, therefore not all of the expanded steam is able to exhaust. This remaining steam is compressed by the returning piston and is thermodynamically desirable as it preheated the hot end of the cylinder before the admission of steam. However, the risk of excessive compression often resulted in small auxiliary exhaust ports being included at the cylinder heads. Such a design is called a semi-uniflow engine. In 1919, Atkinson & Co. began using a Strumph-type "uniflow" engine to create a much larger steam wagons, ultimately resulting in a 12-ton vehicle by 1923. At this point, Atkinson was offering the largest wagons in Britain, and they could carry a larger load than any other truck of its day. Their uniflow engine had relief valves built into the pistons to relieve excessive compression of the exhaust steam. This was a very successful uniflow engine, and is believed to be the only successful on-road uniflow design. A 40 hp version in an articulated chassis was shown at the 1927 London Motor Show. THE DOBLE UNIFLOW STEAM CAR ENGINE. 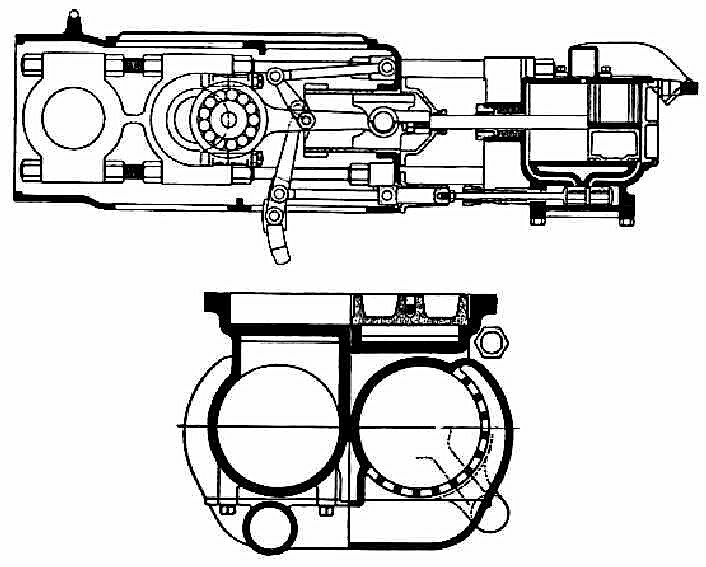 A two-cylinder 5" X 4" double-acting uniflow design, the valve gear was a simplified form of Joy valvegear, using slide valves which could lift to release excessive compression. Cut-off was provided, controlled by a foot pedal. In 1914 Mr. Doble drove one of his cars to Detroit where he found financial backing and produced the first commercially built car know as the Doble Detroit car. The Doble Detroit was the first Doble to use a forced draft burner. It also used a two-cylinder double acting uniflow engine of Doble's design. Doble had obtained capital to get a company going making steam cars but manufacture of the car was stopped by the War Emergency Board. With most available steel going to Army and Marine Corps loans the government refused to give the Doble company an allotment of steel. The project thus failed and Doble returned to California, later in 1920 establishing with his brothers the Doble Steam Motor factory in Emeryville. Piston, crosshead and crank of the engine. Note the multiple exhaust ports of the cylinder at lower right. "In order to have efficient working it is necessary to provide for high expansion. This can be obtained with a compound engine, but not satisfactorily, as the ratio of cylinder volumes has to be carefully determined in relation to the probable loads, speeds and steam-chest pressures. These conditions vary so widely that the single expansion engine, (Shown above) is necessary. To provide the high expansion desirable, with a simple noiseless valve gear and one valve per cylinder, it is imperative to use the uniflow principle. In the uniflow engine the valve takes care of the steam inlet only, the exhaust passing out through ports at the end of the stroke when these are uncovered by the piston. It is thus possible to secure cut-off at 5 per cent of the stroke. Since the thermal conditions in the uniflow cylinder are practically ideal, it is unnecessary to use superheated steam. This means that little cylinder lubrication is required, and the troubles formerly caused by superheated steam are absent." "The uniflow engine was found unsuited for use in a motor vehicle. Its economy in motor vehicle service was definitely less than the compound, it was heavier, uncertain in manoeuvring, apt to block on hills (due to the long compression), and undesirable for high speeds due to the very heavy long pistons. The early cut-off necessary to give sufficient expansion produced an irregular torque, quite unsuitable for a motor vehicle, as the torsional vibrations induced in the axle shafts proved extremely annoying and difficult to damp out. A multiplicity of cylinders, although a certain remedy, would lead to prohibitive cost.